Claims returned with National Correct Coding Initiative (NCCI) edits or Medically Unlikely Edits (MUE) can easily be lost in the shuffle. It's often not clear who is responsible for resolving an edit, and delays from other departments can hold up the process. Some hospitals may even write these claims off, leaving money on the table. Resolving edits can be overwhelming, causing staff to work the same edits repeatedly, unless time and resources are spent to identify and fix the root cause of the problem. 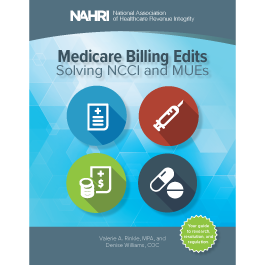 Medicare Billing Edits: Solving NCCI and MUEs will help readers understand Medicare claims edits and give them practical tools and information to efficiently handle these edits, helping to ensure compliance and protect revenue. This robust offering includes a book, webinar, FAQs, and downloadable resources that help break down the definition, resolution, and tracking of NCCI edits and MUEs. Nationally recognized experts Valerie Rinkle, MPA, and Denise Williams, RN, COC, leverage their years of experience as they cover the details of common edits. Using case studies and scenarios, this book will also walk readers through the edit process and show them how to apply the information they’ve learned. Valerie Rinkle, MPA, is a lead regulatory specialist and instructor for HCPro's Revenue Integrity and Chargemaster Boot Camp®, as well as an instructor for HCPro’s Medicare Boot Camp®—Hospital Version and Medicare Boot Camp®—Utilization Review Version. Rinkle is a former hospital revenue cycle director and has over 30 years in the healthcare industry, including over 12 years of consulting experience in which she has spoken and advised on effective operational solutions for compliance with Medicare coverage, payment, and coding regulations. Denise Williams, RN, COC, is senior vice president of the revenue integrity division and compliance auditor at Revant Solutions in Ft. Lauderdale, Florida. She has more than 30 years of healthcare experience, including a background in multiple areas of nursing. For the past 20 years, Williams has been in the field of coding and reimbursement and has performed numerous E&M, OP surgical, ED, and observation coding chart reviews from the documentation, compliance, and reimbursement perspectives. She serves as a contributing author to articles published in HCPro’s Briefings on APCs and is a nationally recognized speaker on various coding and reimbursement topics.